Please Note: This is brand-new stuff that we’re publicly experimenting with. We post it because it’s fun and interesting and we usually get pertinent comments and criticisms that help us refine what we’re doing. For those of you who don’t science much, please remember we’re still testing and improving this process. What we’ll look at today is interesting information. It isn’t an absolute fact, at least not yet. 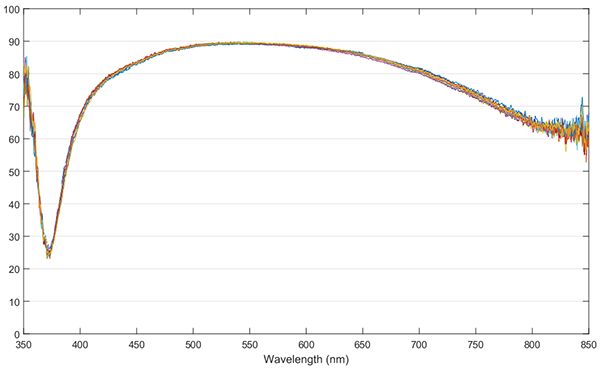 In our last article, we introduced the methodology behind our spectrometry testing. We continue to fine tune that and gather data to explore the process. Most of today’s article will be about color casts in various cinema lenses, but before we get there, I need to do a bit more background. If you’re one of those people who doesn’t care much about methodology, you can skip the first section. Yes, we will think less of you, but you can. We mentioned in the first article that while we got readings from 350nm to 850nm (IR to UV) the data got noisy at both extremes and we didn’t trust it. On the other hand, we really would like to know where the ‘UV dip’ occurred if possible, and if the IR transmission was accurate. We did have access to a couple of lenses that we knew should have broader spectrum transmission than standard lenses: the Coastal Optics 60mm f/4 UV-VIS-IR Macro and the C-4 Optics 120mm f/4.5 Macro UV-IR Apochromat medium format lens prototype (don’t ask, it’s a long story). Running these through our spectrometer gave some interesting results. 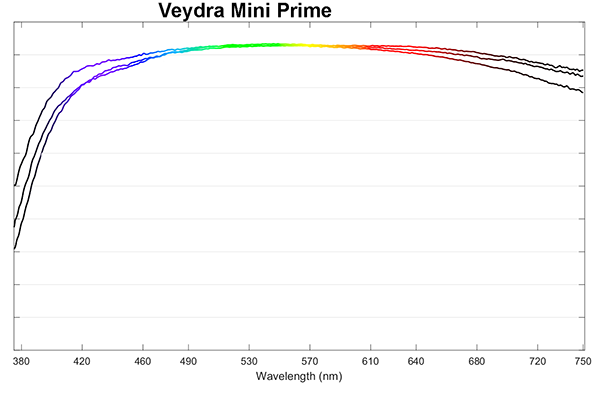 First among these is that the spectra reading doesn’t drop like a rock at 400nm, which is what it did, to some degree, in almost all of the standard lenses we’d tested. You probably noticed that the spectrum looks wavy, not smooth like most spectra. 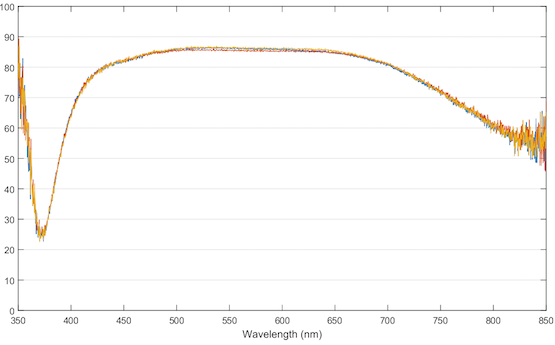 This isn’t unexpected; broad-spectrum coatings (right) generally do not have as smooth a spectra as visible light coatings (left). That the transmission in these two lenses doesn’t nosedive at 400nm the way most of our visible light lenses do, made us somewhat comfortable that we were getting some data in the near UV range. But the increased noise of amplification is quite evident, even more so when we superimpose multiple copy-runs. We decided, therefore, that we would show a range of 375nm to 750nm in our graphs, eliminating the noisiest regions. 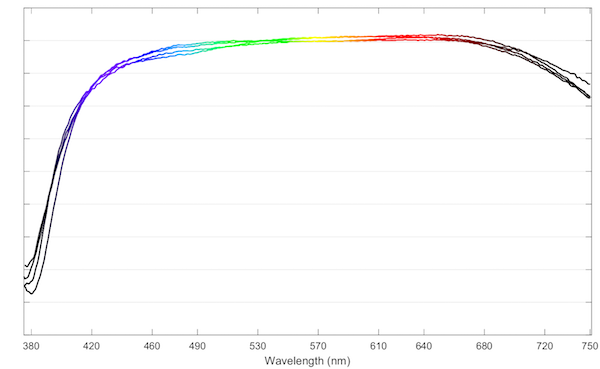 Notice that we change the graph color to black outside the visible spectrum. The data at the edges is noisier and possibly a bit inaccurate. But it’s still reasonably close to reality so we’ll continue to show it. Of course, like any process, as I finished writing this we got more information. 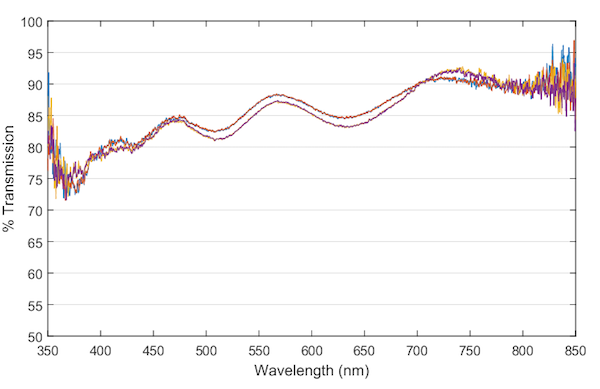 Emmet Rad was kind enough to do some statistical analysis on our spectra and found that the accurate range should be 385nm to 750nm. The graphs were already made at 375nm, though, and I’m not going to replot them all. We mentioned in the previous article that our spectra are relative, not absolute. 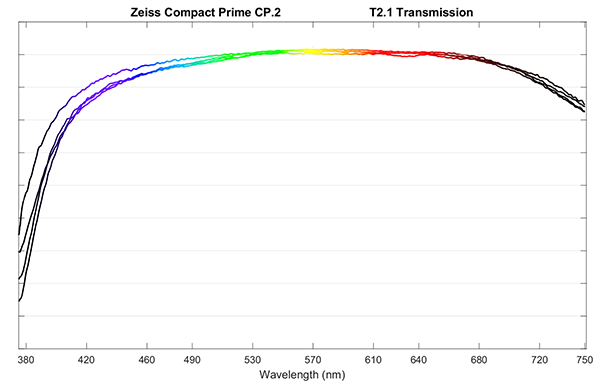 Our equipment has to be calibrated at each aperture size, so the calibration for 35mm T 1.5 lenses (about a 23mm opening) is different than for 85mm T 2.1 lenses (about a 40mm opening). Our primary purpose is to see if all the (for example) Canon 85mm f/1.2L II lenses look the same and it works great for that. If we look at ten copies of any single lens, the graphs basically overlay. 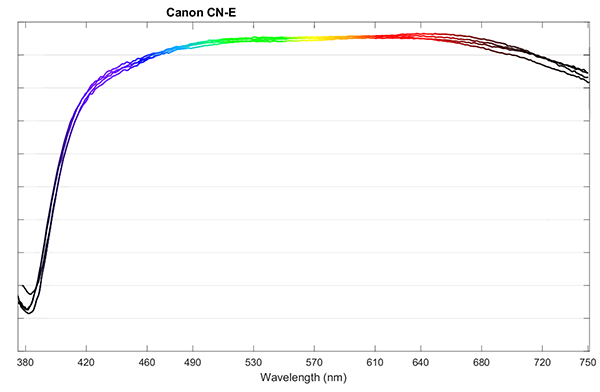 But if we look at two different lenses, they may be a bit higher or lower on the graph, like these two different Canon CN-E lenses. Those curves look pretty similar, but it’s a bit hard to compare them side-by-side. If we overlay one on the other and shift it along the Y axis, so they’re at the same level, it’s easier to compare them. I’m removing the numbers from the Y-axis to remind you that the absolute transmission is not real, we’re simply looking at the relative shape of the spectra. We can see that both of these lenses transmit red and yellow light better than blue and violet. You’ll notice they aren’t the same, but they are pretty close. That makes sense, we expect them to have the same coatings, but perhaps some difference in glass type used and the number of elements. Doing this, although it’s crude, gives us some idea about whether a specific brand has a consistent tint. OK, you got it. For each brand of Cine prime lenses we carry we did spectra on a 35mm, 50mm, 85mm ( or 75mm in the case of the Schneiders), and either 100mm or 135mm, and then overlaid the graphs like the ones above. This is just a hand overlay, not done to a mathematical formula. We’re doing a feasibility study. The Canon lenses all tend to pass a bit less blue and violet light but are fairly flat. You’ll probably notice the little divot around 450nm, very pronounced in one lens, and a bit more subtle in another, and not apparent at all in two. This isn’t focal-length specific. 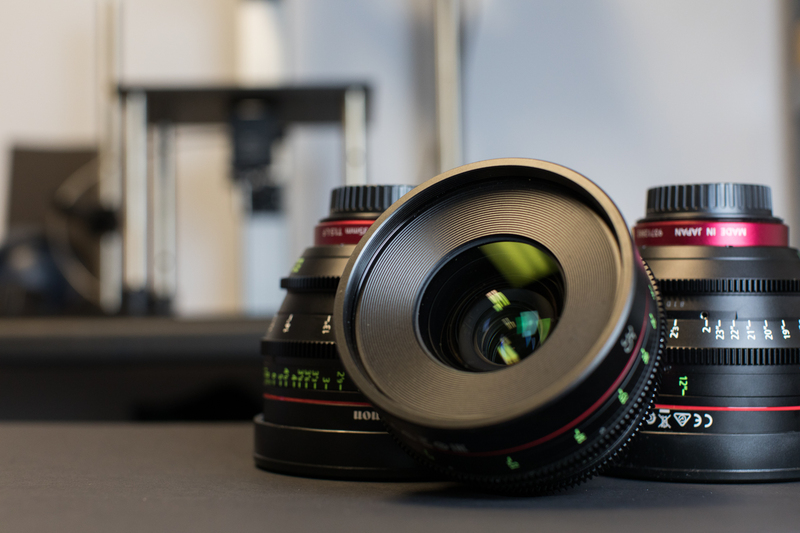 We’ve tested multiple copies of each focal length, and some Samyang lenses have it, some do not. We’ll look at this more in a later post. 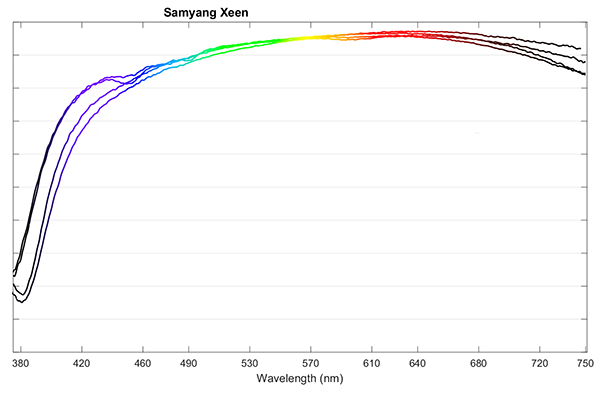 Overall, though, the Samyangs do seem to transmit more at the red end of the spectrum, less at the blue. The Xenons we tested seem a bit less identical than other Cine lenses, but we only had a small sample size for this test. Until I run a lot more of each focal length it could be the lenses, could be our technique. They do all seem to transmit best in the center of the spectrum with a little less red and blue passing through. 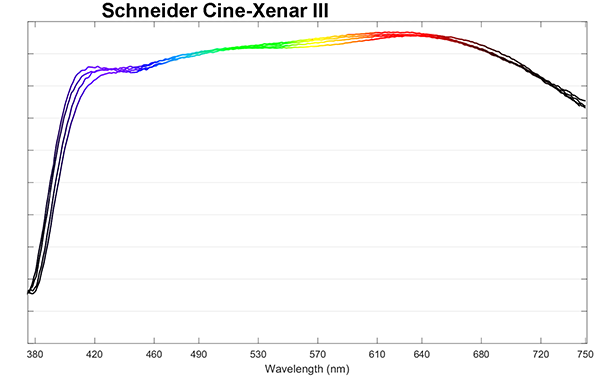 Apparently, the Cine-Xenars look quite a bit warmer than the Xenons, at least from our testing. 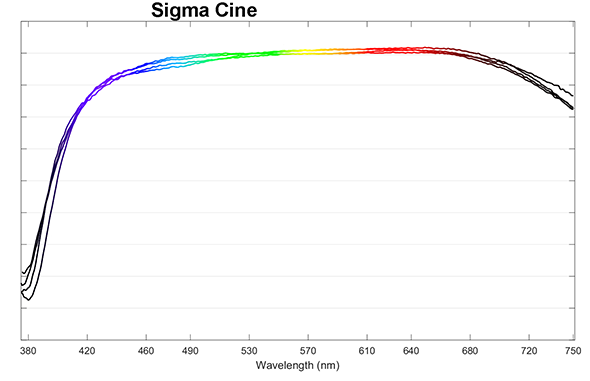 The Sigma Cine lenses are quite similar to the Canons, with just a little bit higher transmission on the red side of the spectrum. There are only three lenses in this one: 35mm, 50mm, and 85mm. The spectra are pretty flat but these pass a bit more in the center of the spectrum. 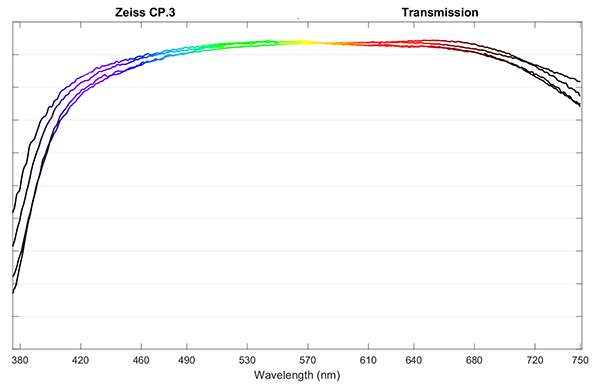 Not surprisingly the CP.2 and CP.3 lenses are very similar, quite flat with perhaps a tiny bit of warm tint. That’s what we wanted to know, was it real and can we actually see it. 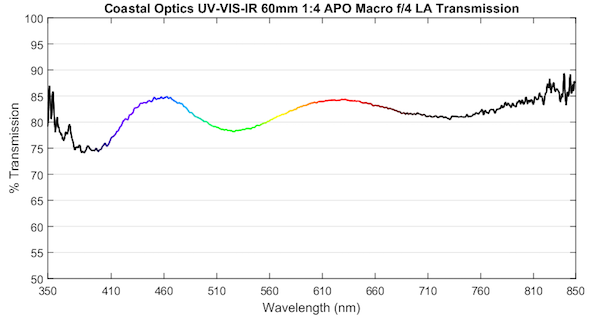 With that in mind, we picked out four lens brands, two that should be relatively warm (red) and two that should be relatively green-yellow (none of these lenses passed blue preferentially). I put thumbnails of the spectra below, so you don’t have to scroll up and down. Then we had Joey take some 18% gray card images in indirect sunlight with each lens on the same camera; Brandon simulated daylight color balance from the raw files and made a tone swatch for each lens. 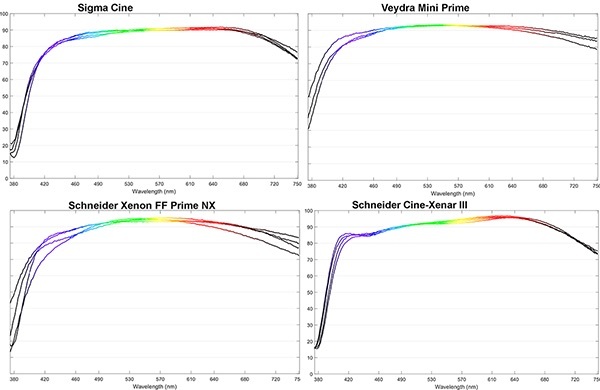 It’s a bit crude, and not particularly sensitive, but (assuming our monitors are reasonably calibrated) you can clearly see the Schneider Cine-Xenar and Sigma Cine lenses are slightly warm, the Schneider Xenon and Veydra a bit greenish. 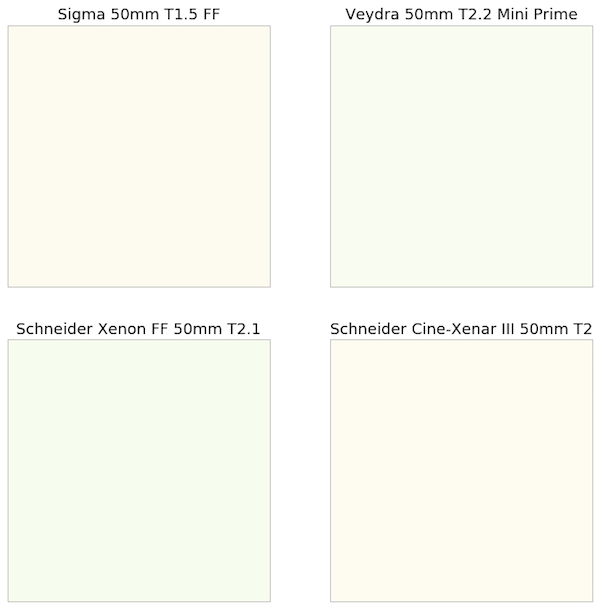 I’m not sure how it will translate to different browsers, but with the original file, the Schneider Cine-Xenar is slightly redder than the Sigma, the Xenon a bit greener than the Veydra. So at this point, we seem to have some camera-level confirmation that the spectra we’re getting are reasonably accurate. For Cine lenses at least, a given brand does tend to have a given look, at least in focal lengths of 35mm and longer. The process we’ve developed seems to be correlating with real-world findings. The differences are slight, and I doubt significant at all unless you mix and match brands during a shoot without color balancing. 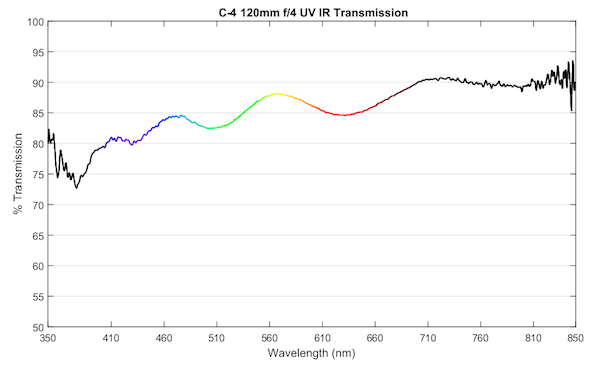 But we’re already learning some things about lens coatings we didn’t suspect, and we’ll show you more as we continue to refine our methodology in the next few posts. Wow! Quite a tour de force. Now I see why you got bored and resentful testing Sony’s “minivan” lens, the 24-105mm f/4! You are all too young to remember those Kodak yellow envelopes of mired filters for adjusting the color of the light going into the lens, but they were pretty standard and worked very well. 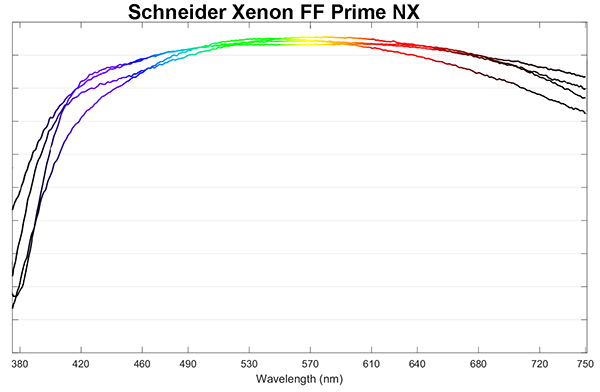 So what do the numbers tell us about selecting a filter to neutralize the color shift on a lens like the 50mm Schneider Xenon. Or would it be more helpful to slap a 1/8 minus green on my lights? ssh, don’t take the bait! Or perhaps I just don’t have any . . . . .
Roger, your work is amazing (as always)! Might I suggest that you help settle the Contax AEG vs. MMJ (what seems to be leaded vs. eco glass, with possible coating differences) issue once and for all? Conspicuous by their absence are the SMC Takumars. Why? Are you afraid that those optical gems will too harshly reveal the shortcomings of all other lenses? Or is it that the magic they perform with light is too staggeringly magnificent for your puny little “instruments” to measure? How are you calibrating them? With a color Checker and the profile creator in Lightroom? There is a lot to unpack here and I don’t want to leave mile long comments on the LR blog. Please email me at brandondube@gmail.com if you would like to have an extended dialogue. Higher order aberrations (HOAs) are not explicitly anything to do with “pop.” If your view is that “pop” stems from a haze around the otherwise tightly distributed PSF, that will never show up in MTF since the spatial frequency associated with it is too low and falls into the ~0cy/mm bin and is normalized away. HOAs, in the Zernike basis, have larger spatial gradients. It is the derivative of the wavefront that is ray error/the cause of blur. Large gradients over small regions of the pupil will throw energy, but not a lot of it, far from the core of the PSF reducing contrast without reducing resolution. Regarding Nikon’s lens, I want to be sure you properly understand what you are linking. Zernike polynomials are 2D, defined over either x and y or rho and phi. They are used as an orthogonal basis set for the phase errors of optics a lot. In what you linked, the Nikon lens has dominant Z8 and Z15 on-axis. It should, since on axis all other terms except Z4 and Z0 are forbidden by rotational symmetry. The others are all due to misalignment, and indeed their magnitude and orientation tells you quite a lot about what is wrong with the alignment. A value of 40nm zero to peak is actually quite good, though that lens benefits there from its relatively modest aperture. The telescope result you linked is actually more misaligned than Nikon’s lens, which says a great deal to their credit to assemble a far more complicated system in a way that is relatively better. Of course, we’ve found that lens to have relatively poor variation, so maybe they have the golden goose. The telescope is also f/6, which is a tremendous advantage compared to f/2.8. Retest the Nikon lens at f/6 and it will be far better than that telescope. Same goes for Canon’s lens. Regarding the ArXive submission. Curvature sensing and wavefront sensing (+/- two variants of the same thing) have relatively severe difficulty being applied to complicated lens systems like that Canon lens. In about 5 weeks when I am able to widely share my thesis, you can have many pages that discuss the difficulty of the task. If you give a lens the same monochromatic benefit of the doubt as you do a telescope, you’ll find many lenses for mere mortals are quite exceptional. E.g. 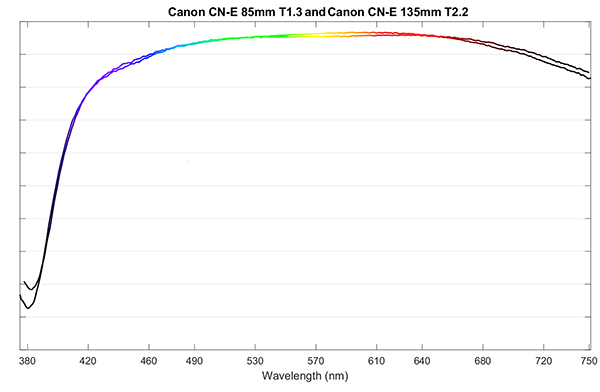 Canon’s 35/2 IS, at f/2 and 546nm, has an MTF that does not drop below 0.2 until about 600cy/mm. FWIW, I have extensive background in both aberration theory and wavefront sensing. If you want to play with higher order aberrations and real images, download prysm ( https://github.com/brandondube/prysm ), use any of the wavefront basis sets to formulate some pupil models, generate PSFs, and convolve them with whatever truth images you want. I can help you (over email) if you run into trouble. Sorry if my intent was not clear; I linked to that URL to comment on “perceived depth” as consequence of microcontrast. Yannick’s observations are valid but lack scientific explanations. That’s where I hope LensRentals Blog can come in with the ability to do some advanced testing. You can see that the Nikon 105VR, what is reportedly “overly corrected” and “has too many elements” by Yannick has really good overall Strehl values but has disproportionately large positive 3rd order spherical aberration (#8) and disproportionately large negative secondary spherical aberration (#15). 2) The slope of a MTF plotted against cycles/mm predicts 3D pop. Right now, our mindset for reporting MTF is at specified lp/mm. So the MTF chart is plotted with MTF on y-axis and image height on the x-axis and each line represents lp/mm in orthogonal planes. What if MTF to be reported for specific regions, and plotted in such a way that the y-axis remains MTF, but the x-axis is now lp/mm. 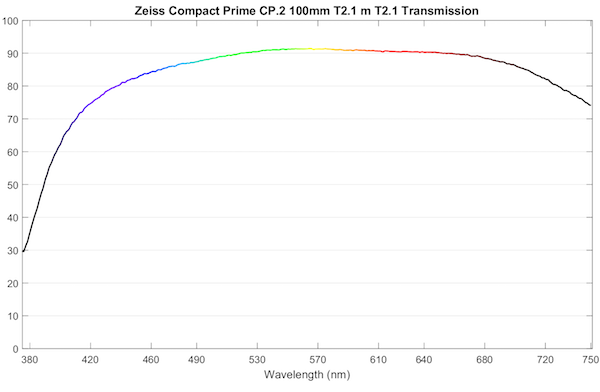 At 1 lp/mm, you’d get ~100% MTF with any decent lens dead center, but maybe some lenses reach 50% at 150 lp/mm while others reach 50% at 60 lp/mm. Maybe high 3D pop has a higher slope (associated with Zeiss) while tonality/subtlty (associated with Leica/Cooke) has a flatter slope. you can see that while the AP optics are superior in Strehl value, the TEC optics have a flatter slope for the MTF and when the TEC is mounted to a camera, it has a Leica-esque look. Very sharp. No detectable chromatic aberration. But contrast is muted not punchy. As with my 50/1.0L, I have a EF mount 300/2.8 SSC Fluorite (only 6 elements) and a TEC 110FL all of which I can lend to Roger for an OLAF measurement ?. I would prefer that you not link places that tout conspiracy theories about element counts in a place where we try to do actual science. The only thing of business value is to be able to check that coatings are good. It’s a small percentage that aren’t, but it is a percentage. That’s the reason we needed a method that is fast. The rest is for fun and to find out things that manufacturers would rather we don’t know. What’s more fun than that? The 50/1.0 has low contrast and a lot of chromatic aberration and average (but not as bad as you think) resolution. It does a remarkable job with the kind of microcontrast and depth characteristics beyond the standard shallow DOF in terms of color though. The 200/1.8 has extreme microcontrast and none of the other weaknesses of the 50/1.0. Interestingly, the Fuji XF 35/1.4 which has good “micro contrast” in terms of depth perception has mediocre MTF. helps maintain the fleet of optics at your company). you’ve opened pandora’s box now Roger! My friend, you have a long road ahead of you. Quite a bit is known about the spectral properties of lenses, but I suspect the manufacturers won’t willingly share that information. You need to separate out the spectral transmission effects of the individual glass elements from the AR coatings and optical cements. High RI glass contains a significant amount of heavy elements, which tend to absorb towards the visible range. This probably accounts for the dip in the spectrum near 400nm. I’m puzzled by the “noisy” spectrum at the edges. I’m not familiar with your instrument, but I rarely saw this type of behavior, except when we had an aging lamp or dirty mirrors. I applaud your goal to educate us (I usually feel smarter after reading your blog posts), but how are you going to use this information to manage your business? Indeed. What I meant is more like a “feeling” of the overall image colors (especially when magentas are in the scene). Flare may also contribute in some pictures, and this is why I am so interested in a more technical analysis of this “pastel feeling”. It would also be interesting to test other old lenses that have “yellowed with age” (Thorium, balm, et cetera). pastel has more to do with the saturation of colors, which is a product of contrast. The actual color tone is a separate thing. +1 for EF 50/1.0 through OLAF, including res and color comparison with EF 50/1.2. The 50/1.0 has very characteristic pastel colors, especially wide open. You better watch what you say! I can’t seem to face up to the facts. I’m tense and nervous, and I can’t relax. I don’t have any but if we get some I’ll definitely add them. Alan, that’s a very good point. And I’m hearing sort of the same thing from Panasonic / Oly shooters. mind to do cinealta’s as well? Those lenses are so underrated and there are so little information about it. I have one set. Most of the cinealta cine lenses apart from the 50mm are breathless unlike canon’s, samyang’s and sigma’s.